A British made solidly built large wooden planter for the garden. An ideal patio planter for brightening up decked areas. 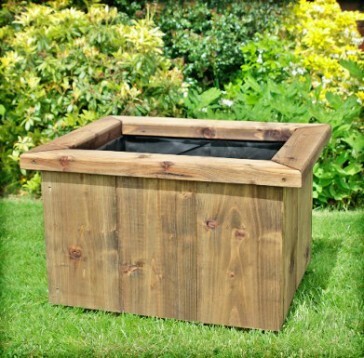 The planter is ideal for deeper rooted plants and shrubs and for growing root vegetables. This wooden planter is built from 2 inch thick treated timber throughout so it will last for years and will prove to be a wise investment. All our planters are lined to prevent rotting from the inside, therefore increasing their lifespan.